Knee Walker Rental - Many models to chose from - Delivery and pick up available. 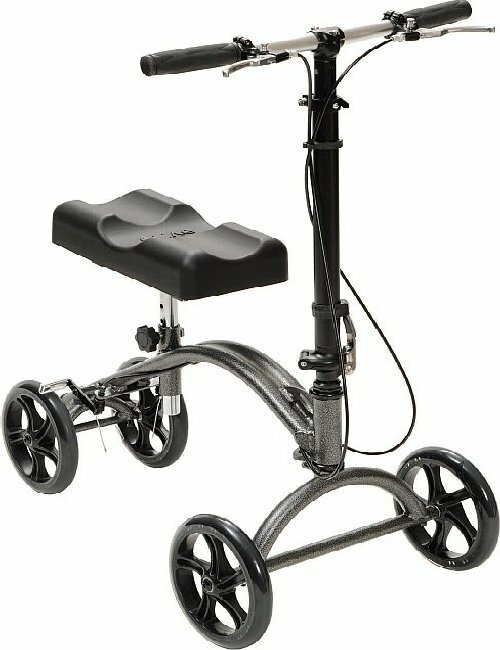 Knee walker rental – Knee walker is a two, three or four-wheeled alternative to crutches or a traditional walker as an ambulation aid. It is known by many other names, such as Knee Scooter, Knee Cruiser, Knee Caddy, Roll About, Orthopaedic Scooter, or Leg Walker. Knee walkers over the years it has taken on many forms, from small-wheeled devices suitable for indoor use to larger sturdier units capable of use outside on grass or paved surfaces. Today’s version is usually a lightweight, foldable design that, with the knee flexed, supports the shin of the unusable limb. The opposite foot makes contact with the floor or ground, providing propulsion. All of our knee walkers have four large wheels, padded knee platform, and front basket. They are equipped with an easy folding mechanism that collapses using a thumb release lever and fits beneath the raised knee platform for ease of storage and transportation. We offer one way free delivery within 20 miles with orders overs $100. Delivery & pick up within 20 miles is included with weekly and monthly rental of Mobility Scooters, Power wheelchairs, and monthly rental of Hospital Beds and Lift Chairs. Additional charges will apply for deliveries beyond 20 miles. You always can pick up from our store in Plano. Please visit CONTACT US page for our address. We have agents standing by!